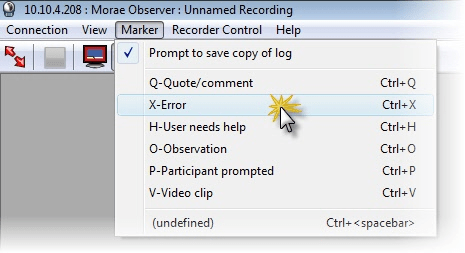 Use markers to quickly log important points in a recording, such as a participant’s comment or a point at which the participant made an error. You can set an unlimited number of markers in a recording. 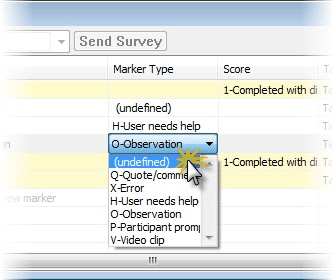 Markers are recording-specific (defined in the study configuration) and all observers for a recording have the same set of pre-defined markers to work with. The task logger log tasks by marking the start and end of a task the participant performs during the recording. Choose <CTRL+[letter]> on the keyboard. This only works for markers that are defined in the study configuration. Choose <CTRL+SPACEBAR> on the keyboard to insert an undefined marker. Select a type in the Marker Type column to define. In the Marker Type column, enter the letter of a marker. Pick a marker from the drop-down list in the Marker Type column. 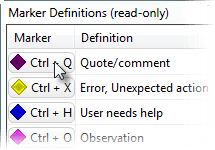 Click a Marker button in the Marker Definitions window. Choose the Marker menu and select the marker from the menu. Defined markers appear at the top of the menu. To create markers without a type assigned, choose the generic option from the list marker types or use the <CTRL+SPACEBAR> hotkey combination. When you are satisfied with the marker type, name, note, and score press Enter, or log another marker. During the recording, you can go back and edit previously logged markers. You can also edit or add markers, tasks, or scores in Manager after importing the recording into Manager.